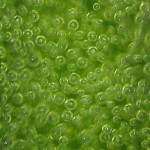 The fermentation of microalgae is an algae production approach without the demand for a complex light supply. Within heterotrophic algae production the algae cells are fed with other carbon sources than CO2 like sugar or acetate for growth. The cultivation of microalgae and other phototrophic microorganisms has led to a global increase in the development of photobioreactors. Central photobioreactor development issue is a maximal growth via an optimal light supply through thin layers of microalgae suspension. The algae or plant cells can only utilize the offered CO2 for photosynthesis and growth when they are supplied with enough light. But the light demand often causes complex constructions, a huge number of surfaces with the resulting high susceptibility to contaminants and with a high energy demand for algae production. These risks can be minimized with cultivation in a closed bioreactor. The ratio between surface and volume is strongly reduced and all technical devices can be sterilized with steam if required. The energy consumption through stirring and mixing decreases as there are just few wall resistance influences during cultivation process. In whole, the production of phototrophic organisms in closed bioreactors has the additional advantage that even highly sensitive species can be cultivated as there is neither a competitive pressure from contaminants nor are they injured by the installed mixing or pumping devices. When using closed bioreactors for the super-clean production of algae or other phototrophic organisms an alternative for the supply with light has to be installed. While photosynthesis is phototrophically based on CO2 and light for fulfilling the organisms’ carbon demand another carbon source has to be added in heterotrophic cultivation. Beside few exceptions, many organisms have developed mechanisms to assimilate other carbon sources than CO2. The capability of growing on sugar or acetate allows these organisms to grow and survive e.g. under dark conditions in deep water or soil layers. This natural property gives an evolutionary advantage to these heterotrophic organisms. Hence, the nutrient composition for heterotrophic organisms must contain a carbon source beside the general demand of plant cells for sources of nitrogen and phosphorus. First, this sounds like a handicap. But the switch to another carbon source leads to a remarkable increase of volumetric production rates. While final dry mass concentrations of photobioreactors are reported with peak values of barely more than 3 g/l, heterotrophic processes easily reach ten- to twenty-fold higher cell densities. This results in much higher areal production rates and better biomass quality than photobioreactors can ever reach.